The Crochet Crowd’s Yarn Box Giveaway sponsored by Spinrite Factory Outlet. 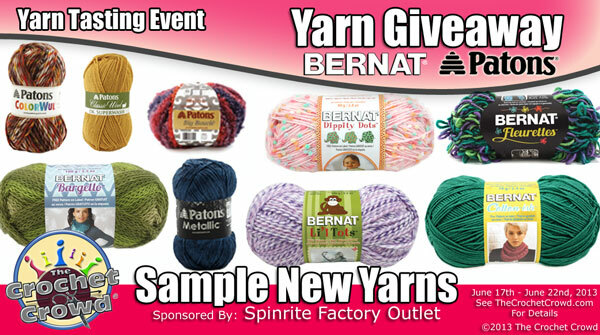 On behalf of The Crochet Crowd, with sponsorship by Spinrite Factory Outlet, I would like to congratulate Paula C of Prince Albert, Saskatchewan for being randomly selected to win the box of Bernat and Patons Yarn. We had thousands of entries from people all around the world. I would like to thank everyone for following the procedures for helping me to keep better organized with entries. Watch your mail Paula, you have a fabulous gift coming to you! Please help me congratulate Paula! I may be doing another giveaway soon. Stay tuned to The Crochet Crowd for details. This entry was posted in Announcements, Crochet Challenges and tagged Bernat, Craft, Crochet, crochet crowd, Giveaway, Knitting and Crochet, Patons, Prince Albert, Spinrite Factory Outlet, The Crochet Crowd, Yarn. Bookmark the permalink. woohoo! Congrats Paula from Shellbrook SK!!! Congrats from Woodstock, ON PAULA!!! Looking forward to seing pictures of ehat you’ve made. Congrats to you again. Thank You everyone for the thank-yous! I am ever so excited! And many many thanks to Mikey and the crochet crowd!! THis is for a difference contest… not the shawl yet… I’ve not got that far today. Conrats on a great giveaway! Enjoy! How wonderful for you Paula!!! You will have to post6 photos of what you make with this windfall! Congrats!!! Congrats Paula, you are a lucky girl!!!!! Congrats Paula! look forward to seeing pics of what you make with the yarn. Wow, lucky girl paula c. Enjoy your prize, I am sure it will keep you in stitches for the rest of the summer. So jealous. Congrats Paula C. Can’t wait to see your post of what you make with your new stash!! Congrats Paula! Enjoy that yarn for all of us. Got really excited when I saw Paula! But alas, it wasn’t me. Hope you enjoy your new yarn Paula C! How was the winner drawn??? *! not a 1. Darn keyboard..
Congratulations Paula!!! I know you will enjoy your new yarn!!!! Oh wow!! How wonderful:) Congratulations Paula! !